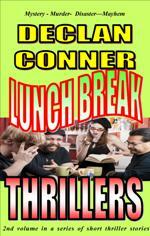 Lunch Break author interviews now open for business. Declan Conner interviews Nigel Bird, a crime fiction short story writer, in what is hoped to be the first of in a line of successful self-published authors. If you wish to take part, or just to read the interview…. here is the page link. Hot on the heels of a number ten spot in the UK for with Lunch Break Thrillers, 1000 average overall out of 450,000 books, and a 24,000 spot in America out of 950,000. 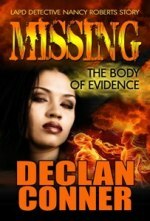 Declan has cracked the new kindle eBook sales ranks in Germany. Survival Instinct (The dark side of Dating) has claimed the number 1 spot for the category of Psychological thrillers and has broken the top 100 at rank at 82 in Crime thrillers, with an overall rank of 1033 out of 750,000 books. Bloomsbury publishers: Surviving the advance of eBook and POD technology. With many publishers, there is a perception in the public eye and in trade circles, that they are fighting a rearguard action against the new technology that they see as a threat to the established order of the traditional publishing world. The cliché, ‘running around like headless chickens,’ comes to mind. Everyone seems to be talking strategies, but their PR as well as their business models needs some serious overhauling, as the word on the street seems indicates many are acting like spoilt children. The actions I am talking about are such as setting up joint eBook stores and trying to slow down the inevitable, by insisting on ridiculous pricing of eBooks in their fight with Amazon, instead of having a coherent strategy to embrace the new world order that is emerging. One such publisher, Bloomsbury, seems to be bucking the trend, by coming out of the closet and finally showing some sense by setting out a vision for the future, to embrace the new technology and to alter its business model to harness the demand for eBooks. This relatively new media has shown tremendous growth throughout the recession and is set to explode as we come out of the world financial crisis and consumers spending power is restored. Not since the introduction of computers created such a stir in the printing world when they made typesetting obsolete has there been such a significant change that will affect the future book printing. By comparison to the big six, Hachette Book Group, Harper Collins, MacMillan Publishers, Penguin Group, Random House and Simon & Schuster, Bloomsbury is relatively small in terms of revenue, but with catalogues boasting the likes of Harry Potter, they are hardly an insignificant player. In 2009, Bloomsbury reported 79,000 pounds/$126,000 revenue from eBook sales. Following this, they digitized over 1,900 titles and in 2010, their revenue rose to 1.5 million pounds/ $2.4 million. In the first quarter to March, the results are even more encouraging at, 1.1 million pounds/ $1.76 million … not bad for three months. If I were the chairman, I would include a small prayer area at their new headquarters to pray that J K Rowling favors them with the digital rights. Despite their progress in harnessing the advance of eBook sales, it doesn’t mean they are to stop printing books, but they are to pare their efforts into printing a core of likely commercial successes,and moving back catalogues and slow-moving sales to POD. With all the talk of publishers going to the wall It would seem they are making all the right moves to survive in this competitive market. Other news is that they are going to continue to seek out new talent to publish. The only news that concerned me was that they were going to use POD as a means of keeping back catalogue in print. I am not sure if this will be good for authors who could normally get their rights back when a book goes out of print. No doubt, the literary agents will be keeping an eye out on those developments. I know if I were one of their author’s, I would be combing through my contract to see if there was a loophole out if this. One thing is for sure, they must be crossing their fingers that J K Rowling, (Who’s agent cleverly negotiated out the digital rights) will favor them if she decides to go the digital route. Until now, she has fiercely refused to go digital, although the rumor mills have been gathering pace of late, with her agent allegedly to have said that, ‘Rowling did not want to cut anyone out of the digital loop.’ (The inference being that she was maybe considering it.) Whilst growth of eBooks sales will grow, with or without Harry Potter, there is no doubt that releasing the series, as eBooks would bring a welcome boost to the sales of eReaders. Amazon: Financial crisis. What financial crisis? Despite reporting lower profits, Amazon continues to fly in the face of the purse strings that seem to be tightening for many companies, as its relentless pace of growth continues unabated. The announcement that it is to add yet another customer support base to its other outlets and based in Scotland, is testament to this. At a time when the UK economy seems to be stagnating, the news is more than welcome that they are to employ 900 staff at the new support centre in Edinburgh and distribution centre in Dunfermline. The support centre is scheduled to open in August, some two months before it opens the mind-boggling one–million-sqr foot distribution centre in Dunfermline. The service outlet is going to provide customer support for kindles and MP3’s. Amazon seems to be firing on all fronts, with the recent addition of its German kindle catalogue on Amazon. com de and its continuing to push the boundaries that Amazon seem hell-bent on giving it the lion’s share of the Global eBook market into the future. Another example of its relentless push for growth is the announcement that it is to open its doors as a publisher. I suspect there are other considerations than growth in arriving at this decision, after some publishers catalogues were pulled in an argument of pricing in early 2010 and thereby firing a warning shot across Amazons bow. Its reliance of traditional publishers, I would imagine, tightened a few butts, until Amazon caved in. The only comforting part of that fiasco is that it gives Amazon a reason to continue to support indie authors. However, I digress; what of profits? Well, I wouldn’t worry too much about that. This past year has been one of high investment for Amazon, with much of the investment written off against profits. The facts are that their sales continue to rise both in America and in the Global market. The investment in infrastructure, products and software will position them to come through the Global crisis even stronger as consumers begin to restore their spending power. To give an indication of the figures, sales came in at a healthy $9.86 billion, up from $.7.13 billion the year before. This figure represented a 45% increase in North American sales and a rise of 31% on international sales. What does this mean to us as authors? Well it rather makes the sales of my eBooks pale into insignificance. But nonetheless, the more Amazon grow locally and internationally, then hopefully, the more our sales will grow. Preciso de ajuda com a tradução do livro do Inglês para Português- Brasil. Durante os próximos seis meses, eu espero traduzir doze contos do Inglês para Português Brasil. Eu tenho onze contos em vários comprimentos, a partir de 4.500 palavras para 10.000 palavras. Se você estiver estudando Inglês e tem um trabalho que você precisa corrigir. Se você é um autor e seu livro precisa preparar-se para publicação no Kindle, da Apple, Kobo Barnes and Noble, Sony, a diesel, etc via Smashwords. 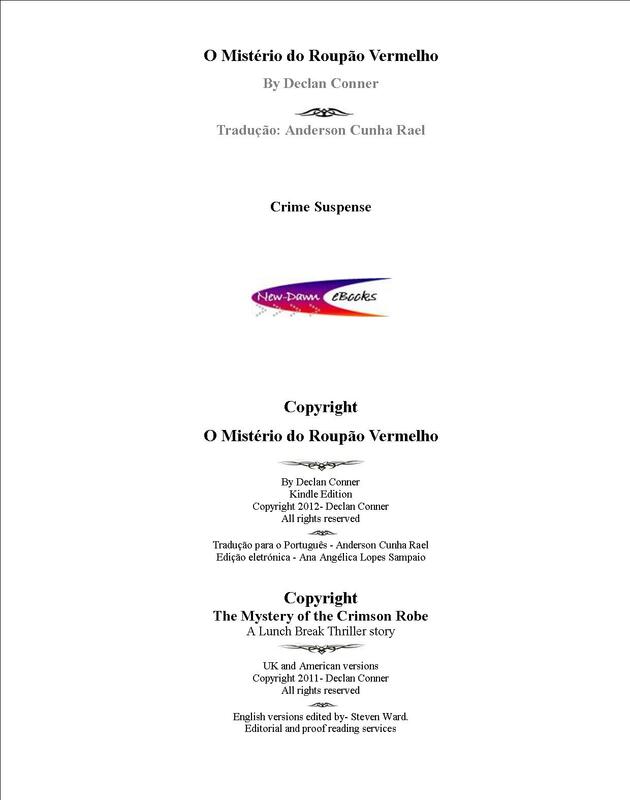 Exemplo de formatação de eBook. Eu estarei postando a tradução em curtos extratos a cada semana, e gostaria de receber qualquer comentário que possa ajudar na qualidade da tradução. When Tim Waterstone was made redundant from WH Smith in the UK, he launched Waterstone’s, by opening the first books store in Old Brompton Road, London, using his 6,000 pounds redundancy money. The year? … 1982. It was a time of opportunity in the UK. England was just coming out of a recession with Margaret Thatcher at the helm. The Romantic music era was in full flow with Duran Duran topping the charts, whilst America was still clinging on to the old favourites. It would be another 16 years before Amazon.co.uk would come along in 1998 to sow the seeds to spoil Waterstone’s party. In the preceding years, 1993 to be exact, it was with some irony that WH Smith, bought Watersone’s for 47 million pounds. Tim must have been laughing all the way to the bank, to think that the 6,000 pounds W H Smith’s had paid him originally had proved to be so fruitful. Amazon. com, meanwhile had previously soldiered on through the dot-com bubble bursting and lawsuits from the book chains in America, aware of the peril Amazon posed to the future of their revenue. It was surprising then that in 1998, the same year that Amazon opened for business in the UK, that an investment vehicle together with Tim Waterstone bought out Waterstone’s from WH Smith 300 million, to become part of HMV. It was now WH Smiths turn to be laughing all the way to the bank. Tim Waterstone left HMV in 2001 and in 2006 failed in an attempt to buy back the company he founded. With hindsight, he may be pleased he failed. With the rise of Amazon’s fortunes in the UK and supermarkets taking a large slice of the book market, together with the economic crisis, Waterstone’s has suffered declining sales. At his stage, I doubt Amazon kindle in the UK opening for business in 2010 has made significant inroads in to Waterstone’s sales and is at the moment more like a flea on a cows back. I say this because my own book reached a rank of 800 out of 450,000 books with sales of only 5 per day on average. So, unless those above me are selling in the millions, the figures now are likely to be insignificant in the overall scheme of things. None the less, it is early days and as we have seen from the growth of eBooks in America, this situation is likely to change. So where does that leave Waterstone’s today? If today’s press is correct then HMV have unloaded all 296 stores together with 4,500 staff to Russian Billionaire, Alexander Mamut, for 53 million, taking a hit of 247 million. I doubt HMV will be laughing as they bank the cheque. Clearly Mr. Marmut can see some value in keeping the book chain alive that eludes me. But as a successful entrepeneur, I bow to his better judgement. Still I suppose the pundits could say, that at 53 million it is on the face of it a bargain at just under 2 x earnings, but when you add the 176 million of debt and if that is cleared down., it raises the stakes to a less that attractive 8 times earnings. It has also been announced, that James Daunt, a former merchant banker and more importantly the founder of Daunt’s bookstores, has been brought in by the Russian cell phone magnet to run the business. It reminds me of Roman Abromavich when he brought Chelsea football club and hired the best in the world to manage the team. Let’s hope Mr. Marmut will be as philanthropic with his purse as Roman in squandering his money, in failing in his ambitions to win the European cup. As for James Daunt, he has quite a task on his hands. If he is to follow his own business model, then it will need deep pockets to tackle the back office IT that is the dinosaur of the much-loved central buying process and deep discounting model, in favour of his own preference for well-trained knowledgeable stall, a depth of product and an end to discounting. Waterstone had already started to give some degree of local purchasing power to managers, together with allowing independents shelf space. With some luck, this will continue. As for the future … who knows, maybe you will be able to buy a cell phone with your books, or alternatively maybe some receiver will be appointed to run the company somewhere down the line and they will be able to sell the leases and net 6,000 pounds. Now that would be ironic. Stop press. News just in. John Malone’s, Liberty Media have bid $1.02 billion for Barnes and Noble amid the companies declining paper book sales. I am really beginning to think there is life in the paper book chains yet, that the money men can see and I can’t. There is clearly more chance of value in Barnes and Noble, as opposed to Waterstone’s, with their success in introducing Nook, which is driving the focus of the company forward. To say I am bewildered by this sudden frenzy of activity, is to say the least, an understatement. Where do you get ideas for short stories? David Gaughram, the much travelled Irish short story author, currently living in Sweden, shares his thoughts on the subject in an article on the short story page. Join David and other authors, discussing the craft of short story writing.